I’m not quite sure I understand the reason behind moving the B4/B5 buttons. I have a Naga Molten which has the “old” placement and they are amazing. I find them extremely easy to use as I barely have to slide my finger off the left mouse button to reach them. The new placement scares me and makes me hope my Naga last forever, because I cannot wrap my brain around how anyone could ever reach those as quickly. Maybe I hold my mouse strangely? I don’t know. I’ve always got my hand flat against the mouse with my fingers resting on the left/right buttons. This new design makes me think I’m just odd and that everyone else must hold theirs in a more claw-ilike grip with just fingers on the mouse. I’m not sure I understand it, either. I found them awkward at first but I grew used to them and now we’re fine. With these buttons – I do find it a bit awkward to press them. I’m thinking I’ll make sure that whatever is on them is not essential or very important, unfortunately. Do you ever find that the Num Lock key doesnt come on after a reboot, and you have to manually toggle it sometimes? That’s a problem I sometimes get. Hmm. I seem to remember having to turn Num Lock on a few times, but I never made the connection. I thought I had just hit it accidentally and turned it off! I have a naga too and thankfully my 4&5 buttons are the old position. I use 4 all the time it is my main reticle placing button. I have it macroed to automatically place it where I click so I have instant heroic leap, mushroom placement, freezing trap, distract and pet nova. 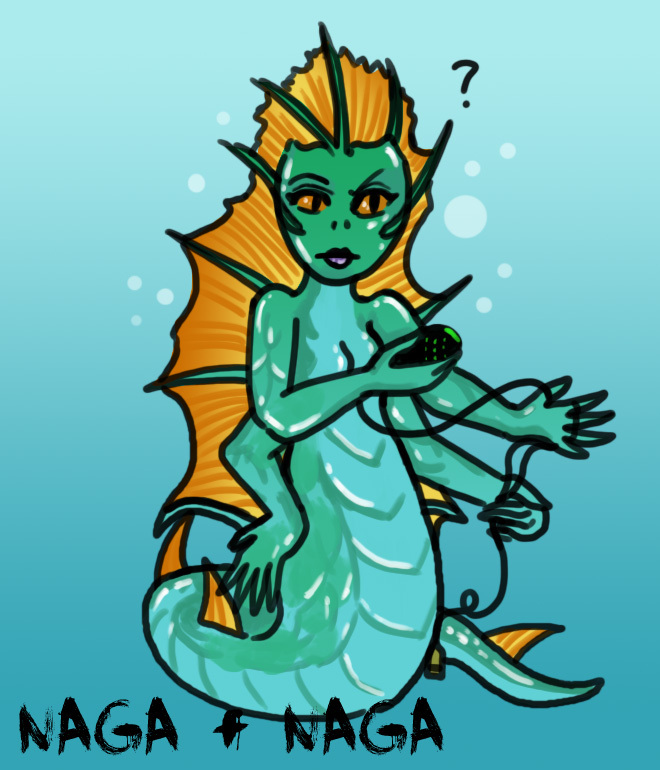 I still tend to have my healing keybound and keep my naga for cool downs. Mind you I still need to play around with settings for my rogue for example because I find that some buttons are not usable from my regular hand position (12,9,8) and I have some useful things bound there at the moment. The synapse thing is annoying too because the old version wasn’t online based and it was only when I reinstalled to switch to 64 bit windows that I had to use it…. And now it is always wanting to update (especially when my kids are using the computer). That sounds like a pretty sweet macro! I’d be interested in trying it out if you are willing to share! It is easy to do – just need to go into the synapse macro tab then you can record it – do so without the delay thr just record the button 4 press followed by a left click. Then if you go back to the profile page you can then assign the macro to the button (click on the button and there is an option to assign macro). I have different profiles set up for my different characters – by default it is just the macro setup on buttons 4&5. My Mage also has one on buttons 1 &2 for the two fire spec ones (I’ve forgotten those ones-although in frost one of those is blizzard). My hunter has an extra two on 3&6 for trap launching and I’ve just added in trap launcher in that too but I haven’t tried it out yet. If you want to see a video you can probably search for “swiftly Razer heroic leap macro” which is what I watched to get the idea although synapse has changed a bit since then. Well, the Logitech is four years old at this point but it got that 18 month break when I was using the Naga. So I guess that makes for 2 1/2 years of solid use. WTB a Naga, although right now I think I’d want one of their keyboards instead. I don’t suppose you use one of those, do you? Although I wouldn’t recommend it for you because of the intense sound of the beautiful mechanical keys. With your variable play hours, I think you’d find it would be a big no-no in your household. But they MIGHT make a non-mechanical version with silent keys as well? It has been great for me, I love it, though I think I don’t use it nearly to its full potential. I’ve never bound anything to a single one of the macro buttons on the side. Oh, I want the mechanical keys! They withstand the pounding, and that’s what I really like. 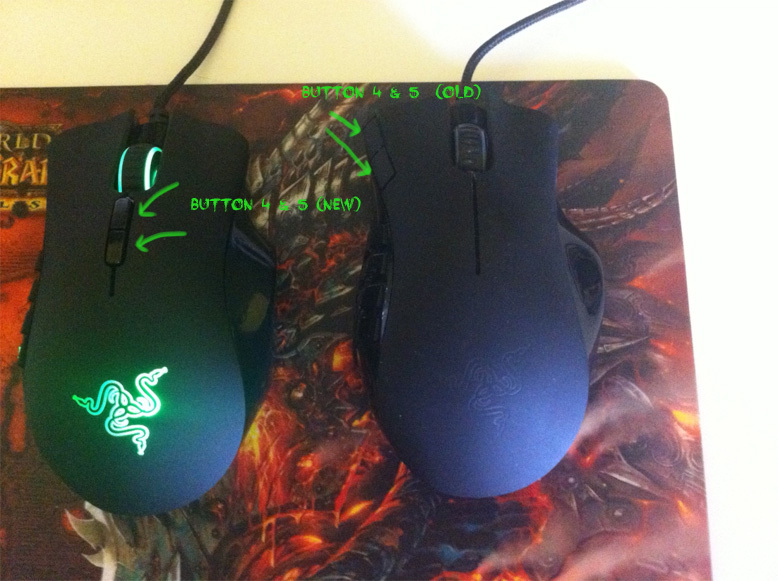 I only ever tried one Razer mouse, the DeathAdder, and while it had a nice scrollwheel, I didn’t like the shiny (i.e. slippery) sides and generally felt it was a bit too long, even for my pretty big hands. I guess one can get used to pretty much any non-terrible mouse but I think it’s absolutely worth trying different mice until you find one that really clicks with you, as it were. FWIW I’m using a Steelseries Xai right now, and it’s the best mouse I’ve used so far – only had it since February last year so I can’t really comment on its longevity, apart from the way the logo has mostly worn off the back. I also have a Cherry G80 mechanical keyboard, which I’d recommend to anyone who needs to type a lot. No fancy gaming-related stuff, just a really nice feel on the keys. Kinda noisy though, which might be a problem in some environments. Nice Review, I hadn’t seen the new button placement, but they also have the 6/7 button version now as well. Mind if I link my own review? Oh nice, thanks for the info! No, I’ve never tried it! If you do, you’ll have to let me know how it goes! Ah, I had a Naga for a long time and loved it but wound up switching back to a five button mouse when my husband and I were sharing a computer for a bit. He wasn’t going to change and swapping out the mice every time we shifted users got old fast. My Naga was about 18 months old when I Craigslisted it, now I feel a bit guilty. I hope it hasn’t died on the new owner. The new Hex has been temping me but I’m going to hold out until the 5 button Logitech dies (almost four years and counting). That’s a really respectable amount of time! I can’t tell whether two years is a short period of time for a mouse, or I am just tough on hardware. I killed my old Logitech G13 as well. The keys just plain stopped working. This time I sought durability when I was choosing a new one! I find 2 years to be really long in hardware life. My dear beloved Death Adder (which showed up by accident in the mail when I tried to order a Naga) is on its last breaths after about 20 months and I think that’s the longest a mouse has ever lasted me. I do have a Naga that I bought after that Death Adder showed up, but I haven’t been able to stick with it long enough to train myself. The edges are just so sharp and my hands miss the softness of a Death Adder. Or maybe I just have disgustingly huge hands. I know my parents should have given me those piano lessons I begged for as a kid. I thought it was funny that our mice died almost SIMULTANEOUSLY to the same issue (the double clicking thing). I’ve never really had a dedicated gaming mouse before this one so I have no basis for comparison! The funny thing is I don’t really have small hands at all, I think I have small palms but long fingers? The Naga just “fits” right, but it did take me – I think they said in the instructions that it takes about 24 hrs of playtime to adjust? And I think it took me about that long. I can’t blame anyone for not wanting that adjustment period though, it is a frustrating time when you are flailing around looking for your buttons, getting yourself killed in stupid ways, and just being generally ineffectual. You might like the Naga Hex! It has only six buttons on the side, which is still a respectable amount of buttons – but they’re easier to find and bigger. I have not held a Death Adder so I don’t know about the softness, but now I have a desire to compare them the next time I get the opportunity! Mice are so personal, there’s no right or wrong, just “whatever works” best for you. I hope you can get a replacement soon though, it’s so frustrating being without. I didn’t realize that your mouse also had double clicking as its final illness! Our mice are twins! Though, from the responses I got on twitter, it seems like it’s a fairly common condition. My mice do tend to die early because, for years, I used them on a laptop. Which means they’ve been dragged EVERYWHERE. Generally it’s the wire or the usb plug that dies. I think this is the first time I kill a mouse from simply overuse. 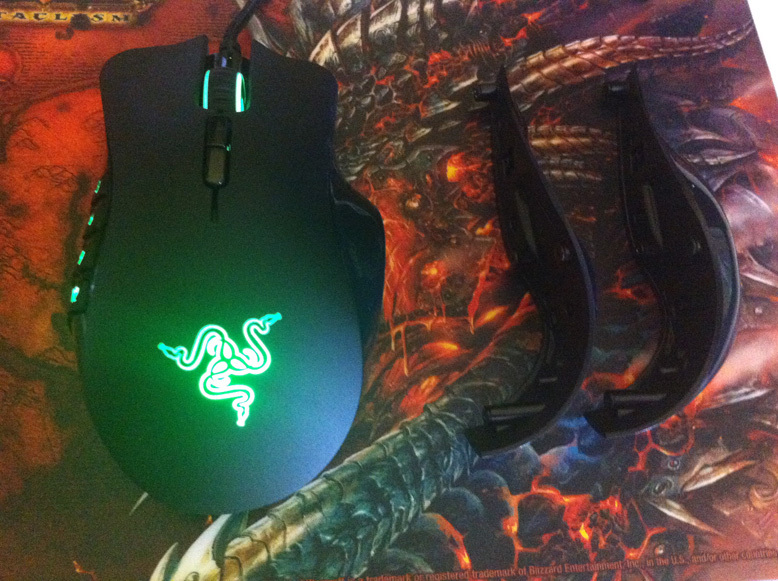 I will give my Naga a good trial run before I decide whether to order another Death Adder. I’m very used to using a mouse + keyboard combo, but maybe if I train myself to just use the mouse and get used to the shape of the Naga, I might come to love the Naga as much as I loved my Death Adder. I agree with Ophelie, a lot of Nagas seem develop the double click disease. Luckily mine’s not in terminal stage yet but I will consider other mice because of this. The Logitechs I used to use worked fine for years but they only had 3 buttons. I wonder about the new 4&5 buttons, I don’t like the current placement and don’t use button 5 at all because it’s so uncomfortable to reach it. 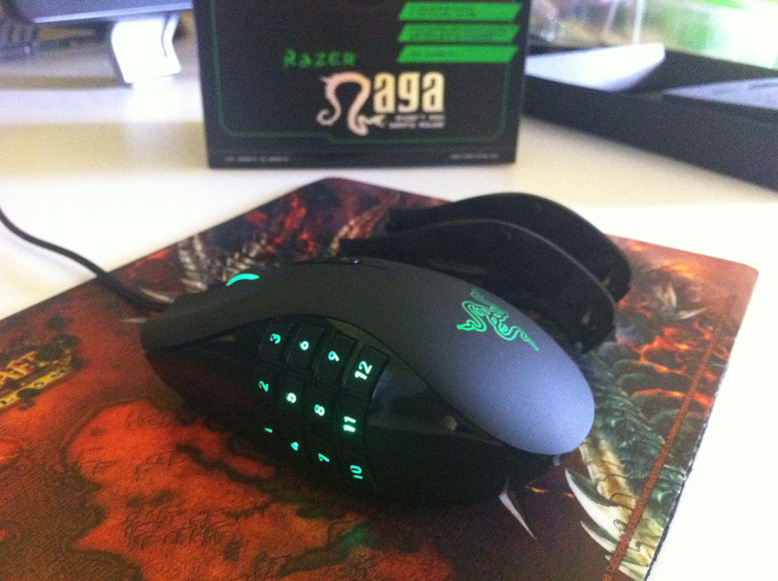 I invested in a Razer Naga earlier this year myself, and it’s frankly the best MMO-gaming mouse I’ve ever used. It’s a tad small for my hand (I bought the older version), but it’s not really a problem. Originally, I used the first WoW-Cataclysm mouse (from SteelSeries?) due to its plethora of buttons, but it unfortunately only works properly with WoW. Honestly, I found it unnecessarily tedious to swap out my mouse for my regular computer use and/or playing other games. I swapped to the Naga because it works fine with everything (if I’m not mistaken, it’s one of the few MMO-mice that works with SWTOR), and its button placement is much more straightforward setup, in my opinion. On a side note, the only time I really use my keyboard in WoW is for typing out messages in chat; instead, I use my Logitech G13 gamepad and Naga simultaneously. I got the impression from the pad’s design that buttons 4, 10, 11, and 12 are the intended movement keys (they have little depressions to make them easy to find without looking, and they’re in the classic WASD formation), but I use the little joystick on the pad for moving my character. This frees up two rows of six keys on the pad, which I use for the normal 1 through = keys. My UI looks quite similar to yours, Vid (I use the exact same setup on the right side for my Naga buttons! ), just I have stacked rows of six in the bottom left that are tied to the regular attack bar. That way, I have 24 abilities literally at my fingertips that I can use while simultaneously move… and my UI reflects exactly how they’re laid out on the peripherals themselves! Wow it makes me want one now!! Unfortunately I can’t use a mouse anymore due to RSI. I use a tablet (which has saved my life.. I couldn’t do my job which is office based or still game if I didn’t have it) as a mouse substitute.